Ulnar impaction syndrome, also called ulnocarpal abutment syndrome, is a common cause of ulnar-sided wrist pain. It is a degenerative condition in which the ulnar head abuts the triangular fibrocartilage complex (TFCC) and ulnar-sided carpals. This abutment results in increased load bearing across the ulnar head, TFCC and ulnar carpals, and subsequent degeneration of the TFCC, chondromalacia of the osseous structures involved (ulna and carpals, especially the lunate), and disruption of the triquetrolunate ligament. 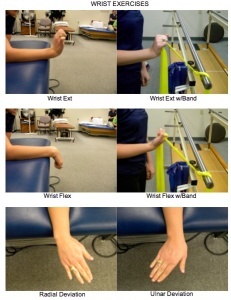 Wrists that do not have a positive ulnar variance, but are considered "ulnar neutral" or "ulnar negative" can also acquire UIS because variance can increase during functional activities, especially those that include forearm pronation and gripping. When ulnar variance increases in wrists that are ulnar negative or neutral (and thus have a thicker TFCC), ulnocarpoal load also increases. 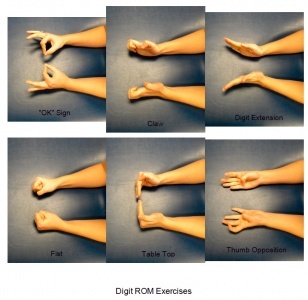 Therefore, although UIS is most common in those with an ulnar positive wrist, it can also occur in wrists with either negative or neutral variance. Ulnar impaction syndrome is insidious and progressive, so patients can have the syndrome without symptoms or can be severely symptomatic when presenting to physical therapy. Common symptoms are: pain, occasional edema, decreased wrist range of motion, decreased forearm rotation, and tenderness to palpation dorsally just distal to the ulnar head and just volar to the ulnar styloid process. The symptoms are commonly aggravated by forceful grip, forearm pronation, and ulnar deviation. Ulnar wrist pathologies often present very similarly in impairment and pain pattern. Thus, diagnostic imaging is often required to confirm diagnosis in the case of ulnar-sided wrist pain, and should be considered after the history-taking and clinical exam. Note: TFCC Injury often occurs secondary to or in conjunction with ulnar impaction syndrome. NOTE- Test is sensitive for UIS but can get positive with other pathologies, such as LTIL injury, TFCC injury or isolated arthritis. Examination of TFCC integrity may be necessary, especially in patients with suspected long-term ulnar impaction syndrome due to commonly seen degeneration of this structure. 2. Ulceration or cystic lesion of the lunate ulnar base and/or ulnar head of radiography, OR low signal intensity of the lunate ulnar base on T1-weighted images of MRI, OR degenerative lesions of the TFCC on arthroscopy (Palmer’s class 2 lesion). Combined arthroscopic TFCC debridement and wafer resection. Conservative treatment should be attempted before surgery and can include immobilization for 6-12 weeks, NSAIDs, corticosteroid injection and limiting aggravating movements such as pronation, gripping and ulnar deviation. Lack of improvement with conservative management is an indication for surgery. UIS can be associated with class 2 TFCC injury and resulting instability of the distal radial-ulnar joint (DRUJ). The therapist should use an impairment based approach to post-surgery treatment and keep in mind that post-surgery patients have had an ulnar resection or removal of a section of the ulnar shaft, deficits resulting from immobilization and may also have TFCC compromise with DRUJ instability. *If joints to be mobilized are considered stable. ROM exercises should be low-load and high repetition within pain limitations to faciliate cartilage repair. Full union expected by 3 months post-ulnar shortening osteotomy. Return to full activity is expected by 6 months post-ulnar shortening osteotomy and 8-12 weeks post-wafer resection. Meftah et al 2010: Arthoroscopic wafer resection for ulnar impaction syndrome: prediction of outcomes. Ulnar impaction syndrome is one of many possible causes of ulnar sided wrist pain, and requires multiple special tests and imaging to confirm diagnosis. If conservative treatment proves ineffective, medical management is indicated and should be followed by physical therapy to address resulting impairments in range of motion, strength, and joint mobility of the upper extremity. Distal radioulnar joint configurations in three-dimensional computed tomography in patients with idiopathic ulnar impaction syndrome. ↑ 1.0 1.1 1.2 1.3 1.4 1.5 1.6 1.7 1.8 1.9 Sammer DM, Rizzo M. Ulnar impaction. Hand Clin. 2010; 26: 549-557. ↑ 2.0 2.1 2.2 2.3 Katz DI, Seiler JG, Bond TC. The treatment of ulnar impaction syndrome: A systematic review of the literature. J of Surg Orth Adv. 2010; 19(4): 218-222. ↑ 3.0 3.1 3.2 3.3 3.4 Baek G, Chung M, Lee Y, Gong H, Lee S, Kim H. Ulnar shortening osteotomy in idiopathic ulnar impaction syndrome. Surgical technique. Journal Of Bone & Joint Surgery, American Volume September 2, 2006;88A:212-220. ↑ Masahiro T, Nakamura R, Horii E, Nakao E, Inagaki H. Ulnocarpal impaction syndrome restricts even midcarpal range of motion. Hand Surg Jul 2005 10(1): 23-27. ↑ 6.0 6.1 6.2 6.3 6.4 LaStayo P, Weiss S. The GRIT: A qualitative measure of ulnar impaction syndrome. J Hand Ther. 2001; 14(3): 173-179. ↑ 7.0 7.1 7.2 7.3 7.4 7.5 7.6 7.7 Sachar K. Ulnar-sided wrist pain: Evaluation and treatment of triangular fibrocartilage complex tears, ulnocarpal impaction syndrome, and lunotriquetral ligament tears. J Hand Surg. 2008; 33A: 1669-1679. ↑ 8.0 8.1 8.2 8.3 8.4 8.5 8.6 Webb B, Rettig L. Gymnastic wrist injuries. Current Sports Medicine Reports. September 2008;7(5):289-295. ↑ 9.0 9.1 9.2 9.3 Tomaino M, Elfar J. Ulnar impaction syndrome. Hand Clinics [serial online]. November 2005;21(4):567-575. ↑ 10.0 10.1 10.2 Lichtman D, Joshi A. Ulnar-sided wrist pain. Medscape Reference. Updated July 2009. Available from: http://emedicine.medscape.com/article/1245322-overview#a2. Accessed November 19, 2011. ↑ Forman T, Forman S, Rose N. A clinical approach to diagnosing wrist pain. American Family Physician. November 2005;72(9):1753-1758. Available from: American Academy of Family Physicians. Accessed November 20, 2011. ↑ Guardia III C, Berman S, Azevedo, C. Ulnar neuropathy clinical presentation. Medscape Reference. Updated May 2011. Available from: http://emedicine/medscape.com/article/1141515-clinical. Accessed November 20, 2011. ↑ 13.0 13.1 13.2 13.3 Vezeridis PS, Yoshioka H, Han R, Blazar P. Ulnar-sided wrist pain. Part 1: anatomy and physical examination. Skeletal Radiol. 2010; 39:733-745. ↑ 14.0 14.1 Tatebe M, Nakamura R, Horii E, Nakao E, Inagaki H. Ulnocarpal impaction syndrome restricts even midcarpal range of motion. J Hand Surgery. July 2005;10(1):23-27. ↑ 15.0 15.1 Nakamura R, Horii E, Imaeda T, Nakao E, Kato H, Watanabe K, The ulnocarpal stress test in the diagnosis of ulnar-sided wrist pain, J Hand Surg. 1997; 22B:719–723. ↑ 16.0 16.1 16.2 16.3 Watanabe A, Souza F, Vezeridis PS, Blazar P, Yoshioka H. Ulnar-sided wrist pn II. Clinical imaging and treatment. Skeletal Radiol. 2010; 39: 837-857. ↑ Shin AY, Deitch MA, Sachar D, Boyer MI. Ulnar-Sided Wrist Pain: Diagnosis and Treatment. J Bone Joint Surg. July 2004;86A(7):1560-1574. ↑ Chun S, Palmer AK. The ulnar impaction syndrome: follow-up of ulnar shortening osteotomy. J Hand Surg. 1993; 24: 316-20. ↑ 19.0 19.1 19.2 19.3 19.4 Meftah M, Keefer EP, Panagopoulos G, Yang SS. Arthroscopic wafer resection for ulnar impaction syndrome: Prediction of outcomes. J Hand Surg. 2010; 15(2): 89-93. ↑ Feldon P, Terrono AL, Belsky MR, The “wafer” procedure, partial distal ulnar resection, Clin Orthop 275: 124-129, 1992. ↑ 21.0 21.1 21.2 Duke Orthopaedics: Wheeless’ Textbook of Orthopaedics Website. Avaliable at: http://www.whellessonline.com/ortho/. Accessed November 5, 2011. ↑ 22.0 22.1 22.2 Belcher HJ. Ulnar Osteotomy. Available at: http://www.pncl.co.uk/~belcher/information/Ulnar%20osteotomy.pdf. Accessed November 18, 2011. ↑ 24.0 24.1 Ulnocarpal Impaction Syndrome. Available at: http://eorif.com/WristHand/UlnocarpalImpaction.html. Accessed November 18, 2011. ↑ Ozer K, Scheker LR. Distal radioulnar joint and treatment options. Orthopedics. 2006; 29(1): 38-49. ↑ Marti RK, van Heerwaarden RJ. Osteotomies for posttraumatic deformities. Thieme; 2008: 221-22.